Waitomo The Legendary Black Water Rafting Co.
Get ready to go underground, swap the skyline for inky cave depths and illuminated crags. Waitomo is all about the caves. This is a subterranean environment like no other, with adventure activities to match. Back above ground there’s no risk of getting bored either. Get a taste of the hikes New Zealand is known for: varied and lush, chase waterfalls and stumble upon cave wonders that aren’t buried so deep. Our Waitomo travel guide will make sure you get the most out of this unique spot. Rated amongst New Zealand’s top attractions, Waitomo Glowworm Caves sits in a small Kiwi town, hiding a whole lot in its hills. A little over two hours south-west of Auckland you’ll hit the dairy farming heartland surrounding Waitomo. Fresh air, rolling green fields and untouched native forest await, but the real attractions lie out of sight, in the huge cave system. Waitomo has more than 300 known caves and they’ve had plenty of time to develop their beauty since being formed 30 million years ago. Impressive stalagmites, stalactites and limestone structures line the caves. Marine fossils add to the fascination factor, a reminder of the caves seafloor beginnings millions of years ago. 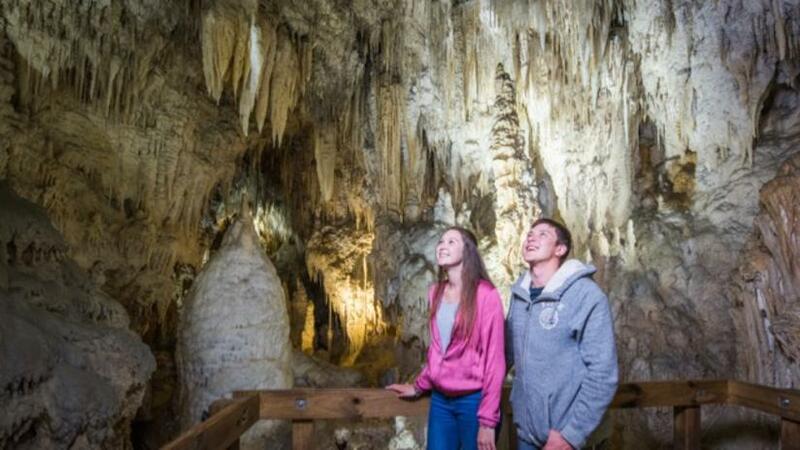 The caves were first discovered by the local Maori tribe in the late 19th century, also explaining how the name ‘Waitomo’ came about. Wai means water, tomo - sinkhole, so Waitomo translates to ‘stream which flows into the hole in the ground’. The adventure potential of this ‘hole in the ground’ means that these days it’s not only the stream that flows through this amazing site. Don your wetsuit and get ready for a good time. This is how to experience the caves with maximum adrenaline factor. The guides are awesome and will get you zipping, jumping and floating through Ruakuri Cave for the most fun you can have in this deep, river-led adventure haven. The big daddy of cave tours, the Black Abyss starts off with a 35m abseil down into the caves before zipline action, tubing and climbing up (or jumping off!) waterfalls awaits. The Black Labyrinth tour is similar but shorter. 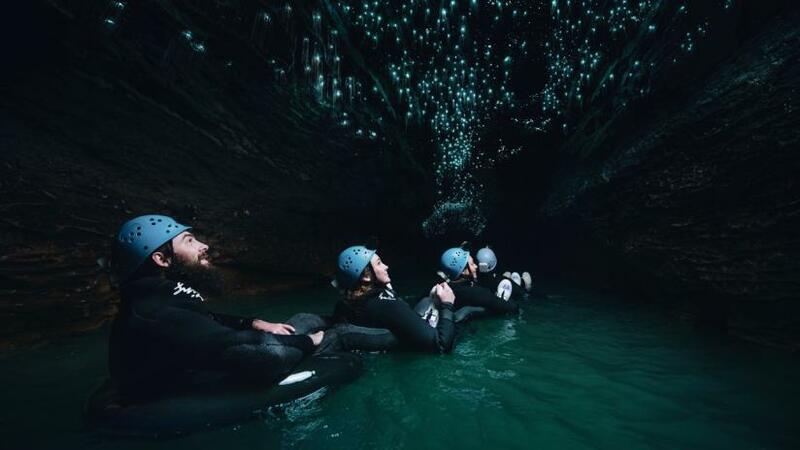 Most importantly both tours get you floating down hidden parts of the cave where thousands of glowworms make for an other-worldly glowing experience. Cost (with Kiwi Experience special rates): $185 for Black Abyss (normally $225), $95 Black Labyrinth (normally $125). 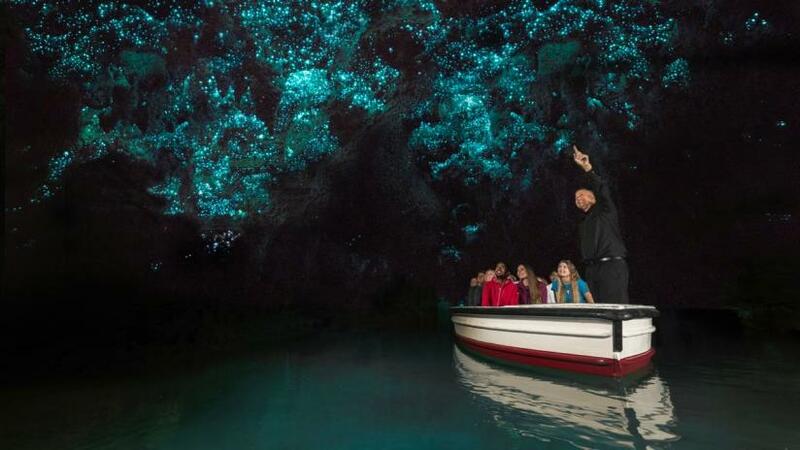 Going through Waitomo Glowworm Caves is a dazzling, other-worldly experience in a category of its own. It’s the millions of delicate stalactites clinging from the ceiling, cathedral shaped interior and the Milky Way-esque Glowworm Grotto that make it so unique. Maori Chief Tane Tinorau was the first to explore the caves in 1887 and started showing intrepid 19th century tourists it’s vast chambers and dazzling insect larve - otherwise known as glowworms! Tinorau’s legacy lives on, many of the current guides are direct descendants and you’ll get to retrace his steps through the ‘The Cathedral’ - bust out your favourite tune if you’re up for testing out the impressive cave acoustics. The tour winds up by boat, gliding silently underneath the Glowworm Grotto; laced like incredibly intricate fairy lights in the roof of the cave, these are the most memorable ‘insects’ you’ll probably ever see. If you’re looking to boost your cave fix there’s a triple cave combo available. It means you can also check out Ruakuri Cave by foot (where Black Water Rafting takes place) and the smaller Aranui Cave, Waitomo’s hidden secret with some of the most intricate limestone formations. If glowworms in the caves weren’t enough, the creatures also come alive in the forest at night. One of the area’s most popular walks, during daylight hours head along to see the Ruakuri Natural Bridge. It’s all rocky outcrops and lush forested gorge along this track, before arriving at the lofty cave. 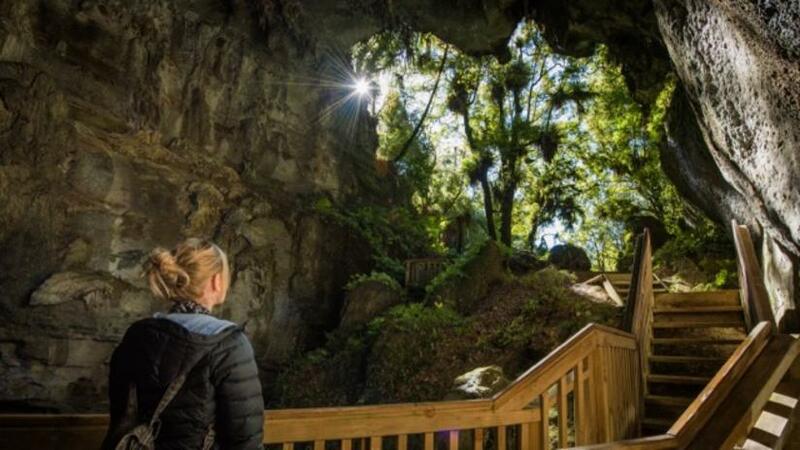 There’s a viewing platform that get you right inside the cave - bring a torch to fully admire the stalactites and stalagmites hidden in the darkened surrounds. Come back once it’s dark (hang onto that torch) and head either side of the the main bridge for a magical illuminated forest. Glowworms line the banks of the tracks, making an after dinner (or pre-pub) stroll well worth it. New Zealand’s most beautiful waterfall? You don’t need to walk too far to decide for yourself. An easy 10 minute stroll will get you to this 35m beauty, at its best after a decent rainfall. Snap your ‘gram on the viewing deck then take the small trail down to the river to get up-close and misty with the waterfall. An impressive 17m arch is all that remains of this ancient cave system. Another easy walk, cross the bridge over a leafy gorge and cover the 20 minute loop track to get up and under this epic towering arch. Take a closer look and you’ll spot the ancient fossilised oysters in the rocks. 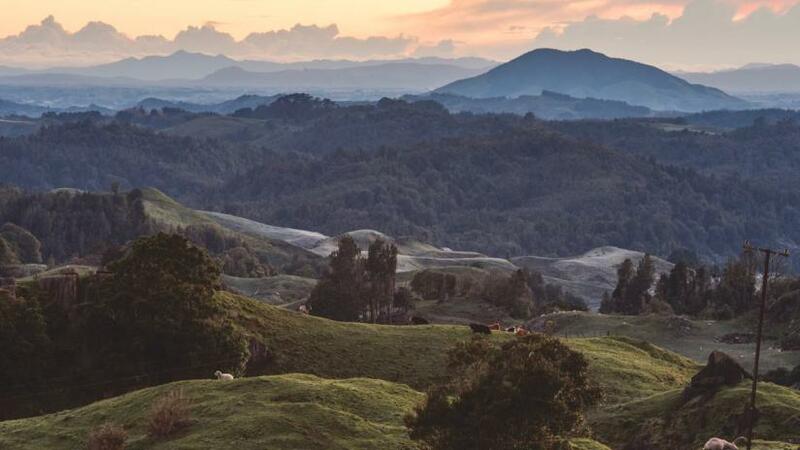 The track back leads you out of the forest and through some scenically rugged Waikato farmland. A cosy hostel to rest up after a day of caving, the rooms are simple and clean, with a large communal kitchen if you’re looking to cook for yourself. Most importantly it’s easy strolling distance from Waitomo’s best (and only) local bar. 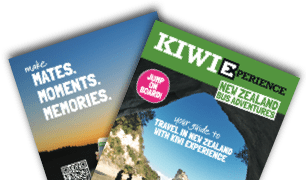 With a solid small-town selection for eating out, Waitomo has backpacker friendly options, a local pub, plus something a bit more special if you want to splash out. The local go-to has been given a face-lift recently, but the mix of locals, tourists and bigger-night-than-expected stays the same. Hearty pub meals are available, match with the local beers on tap and let the day's stories of epic caving flow. Kiwi Paka Hostel’s eatery, it might be the default option but it’s a good one. Reasonably priced pizzas will fill the massive hunger gap after a day caving and hot breakfast options are available in the morning. The perfect morning tea stop before a day in the caves. Their coffee will get the adrenaline pumping before you’ve even reached the caves, grab a freshly baked muffin or hot flaky pie to complete the pre-cave fueling. New Zealand cuisine is hard to define - but Huhu’s menu reflects it pretty well. Great cuts of meat, vegetarian options that are actually exciting, plus a sprinkling of native ingredients adding an extra kiwi edge. Delicious dining, worth paying a little extra for. In the land of flat whites and brunches, every town has at least one decent option for your morning fix. Waitomo General Store does a good eggs benedict and their coffee ticks all the boxes. The Waitomo Glowworm Caves visitor centre and Black Water Rafting both have cafes with tasty cabinet option. Black Water Rafting’s Cave Cookies are legendary - treat yourself if you don’t get one while underground! Once it’s time to get back to broad daylight, the rest of the central North Island is your day-trip oyster. Surf town supreme, this is a chilled town that’s hard not to love. Just over an hour from Waitomo, grab a board and ride the (often massive) waves. Lessons are available, or head straight for the famous left-hand break if you’re already at the level. For land lovers there’s plenty of hikes along the rugged and wild coast. Back in town there’s some great cafes plus a few arty shops and galleries. 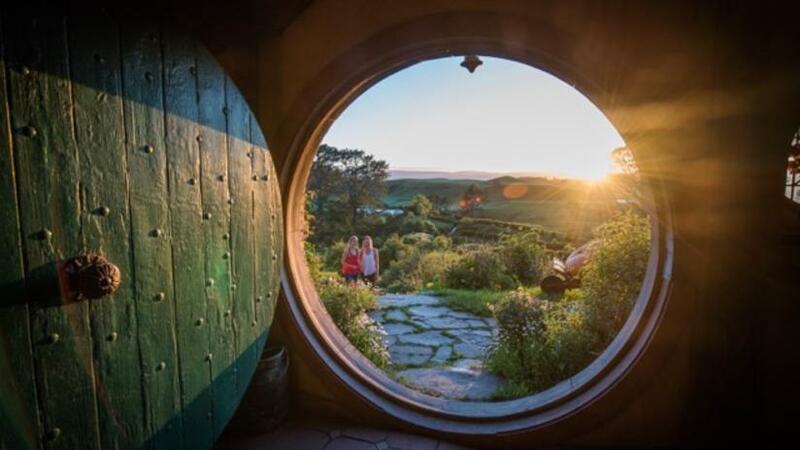 Another heavy-hitter on the New Zealand attractions list, Hobbiton is the next destination for many travellers after visiting Waitomo Caves. It’s idyllic beauty is picture perfect and a must-do for any LOTR fan. At just over an hour’s drive from Waitomo it’s an easy next stop on the Trilogy circuit. This is a geothermal wonderland where the sights make up for the smells. Wander Te Puia where geysers burst out into the sky and boiling mud bubbles away in the ground. 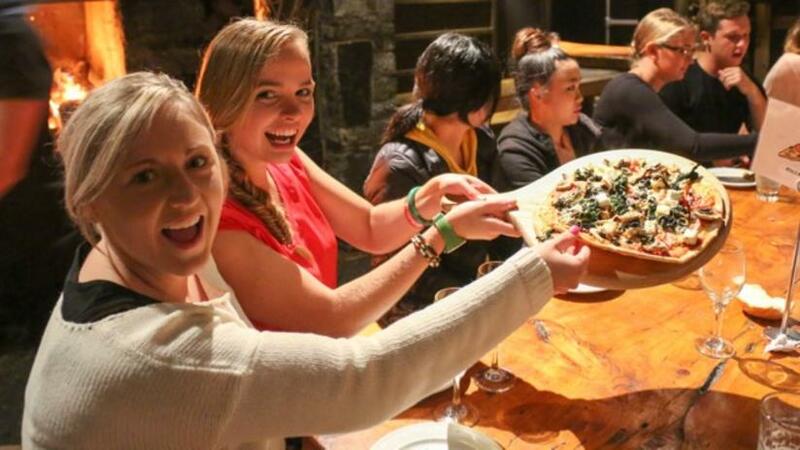 Nearby is one of New Zealand’s best Maori cultural experiences , with an equally impressive hangi feast to match. 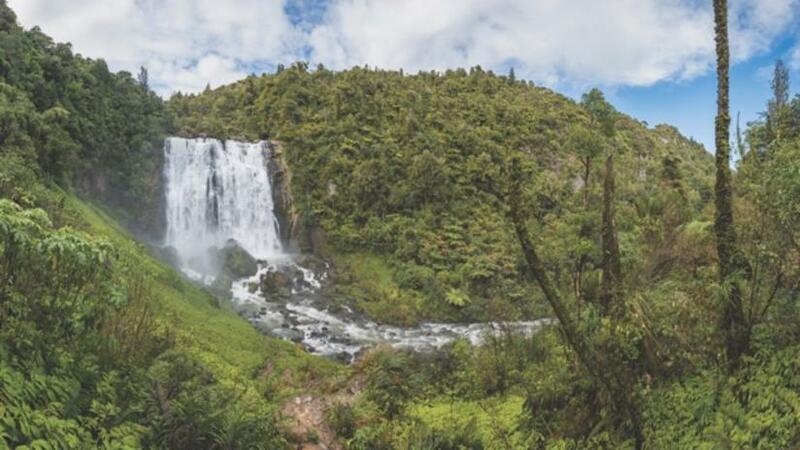 Thrill seekers put Kaitiaki Rafting on your list, they’ll get you plummeting off the world’s highest commercially rafted waterfall on Rotorua’s fast flowing Kaituna River.